Ryder System, Inc. (Ryder), headquartered in Miami, Florida, is a publicly traded (NYSE: R) corporation founded in 1933. We are a global leader in commercial fleet management and supply chain solutions. Ryder’s mission is to provide innovative solutions that are reliable, safe, and efficient, enabling our customers to deliver on their promises. We seek to deliver compelling solutions that will convince customers to outsource their fleet management and supply chain needs to us. We operate primarily in three business segments: Fleet Management Solutions (FMS), Dedicated Transportation Services (DTS), and Supply Chain Solutions (SCS). Our FMS business segment provides full service leasing and flexible maintenance leasing options, commercial rental, and contract or transactional maintenance services of trucks, tractors, and trailers to customers principally in the U.S., Canada, and the U.K. DTS provides vehicles and drivers as part of a dedicated transportation solution in the U.S. Finally, SCS provides comprehensive supply chain solutions, including distribution and transportation services in North America and Singapore. Our total revenue was approximately $8.4B. For more information about our business, products, and financials, see our 2018 10-K.
As of December 31, 2018, Ryder had approximately 39,600 employees across the globe; a breakdown of our U.S. & Canada employee base by location, gender, and employment type can be found below. 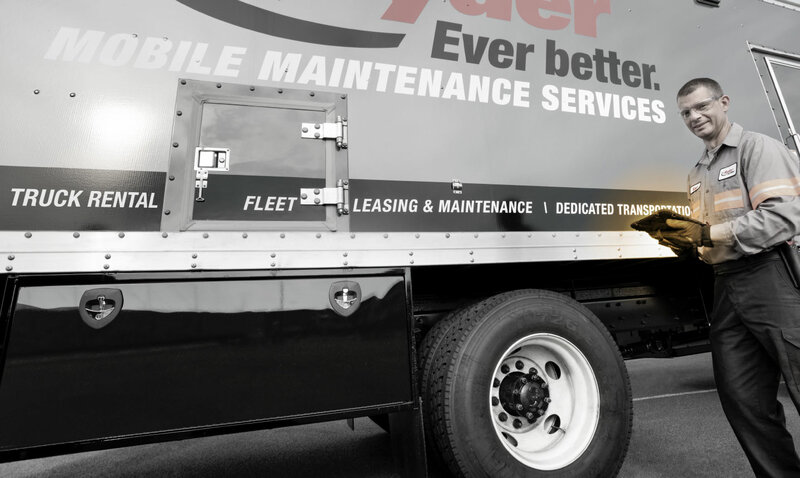 Ryder maintains relationships with a number of original equipment manufacturers (OEMs) who provide us with the vehicles and vehicle parts necessary to meet our customers’ needs and specifications. For leased units, Ryder’s sales team works with the customer to define the appropriate vehicle specification for the customer’s application and use. For rental units, Ryder defines its desired vehicle specification internally based on customer demand. Once the vehicle has been built, we maintain service level agreements with manufacturers to ensure that the vehicle is delivered to a Ryder location in a timely manner for in-servicing, or to a body manufacturer if the unit requires the installation of a truck body, such as a flat bed, box, or a refrigeration unit. Given that some of our suppliers build vehicles outside of the United States, the delivery process also entails our involvement in all steps necessary to ensure a seamless international transition, including customs brokerage, import clearance, and coordinating necessary inspections. For vehicle parts, in addition to sourcing from both OEMs and non-OEMs, Ryder has also partnered with a limited number of distributors. These distributors work in conjunction with OEM and non-OEM parts suppliers to stock and warehouse parts on behalf of Ryder and deliver them to a Ryder facility. We also purchase parts in-house through Ryder Fleet Products, an authorized distributor of over 250 automotive, truck part, and tool manufacturers. This enables us to ensure that we have access to multiple supply sources for parts and avoid maintaining excess inventory in our facilities. We provide our FMS customers with access to diesel fuel at competitive prices at our maintenance facilities across the United States and Canada. We also provide fuel services such as fuel planning, fuel tax reporting, centralized billing, fuel cards, and fuel monitoring. For each of our geographic markets, we invite several fuel refineries and re-sellers to bid on Ryder’s fuel volume. We may engage multiple suppliers for a given area depending on our internal assessment of anticipated volume. To ensure that we have adequate fuel supply to mitigate against natural disasters or other supply disruptions, we also maintain relationships with suppliers outside of a given market that offer us the ability to make on-demand fuel purchases and/or provide delivery of fuel to designated areas where it is most needed. By taking an active role in our member organizations, including through our position on various committees and councils within these organizations, we increase our available resources to learn and share best practices. These memberships also provide Ryder with an avenue to not only participate in but help shape the dialogues that greatly impact our industry and our business. Ryder’s position as an industry leader is built on trust. That trust has been earned over 85 years of demonstrating an unwavering commitment to customer service, sound ethics, strong corporate governance, and personal integrity. We are the current caretakers of a long-standing reputation and legacy, and we will continue to uphold the values that have served our Company and our stakeholders for nearly a century.